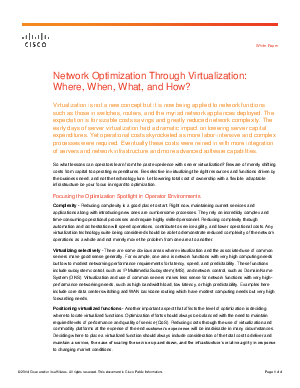 > Cisco > Network Optimization Through Virtualization: Where, When, What, and How? Virtualization is not a new concept but it is now being applied to network functions such as those in switches, routers, and the myriad network appliances deployed. The expectation is for sizable costs savings and greatly reduced network complexity. The early days of server virtualization had a dramatic impact on lowering server capital expenditures. Yet operational costs skyrocketed as more labor-intensive and complex processes were required. Eventually these costs were reined in with more integration of servers and network infrastructure and more advanced software capabilities. So what lessons can operators learn from the past experience with server virtualization? Beware of merely shifting costs from capital to operating expenditures. Be selective in virtualizing the right resources and functions driven by the business need, and not the technology lure. Let lowering total cost of ownership with a flexible, adaptable infrastructure be your focus in regard to optimization.